I took an old Holy Week bulletin from a previous year, glued some cream cardstock, front and back to make the covers, and covered the spine in black bookcloth tape. Then I had to let it dry some, before decorating the cover. I glued the pages to each other inside, which made for a 6 page booklet to cover 8 days (I decided to include Easter). That had to dry. So I went off to research what actually happened between Palm Sunday and Maundy Thursday. For Palm Sunday, I sponged acrylic sponged over the text, added pictures from the internet and doodled some background stuff. For each day, I'm adding the gifts for that day on a "Smash" card, or similar. 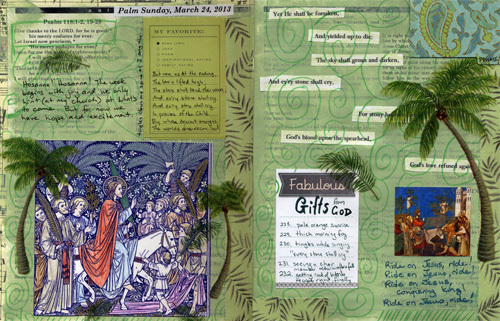 For Palm Sunday, I wrote down some favorite lyrics, and some private and not-so-private thoughts about the day. As I ended up doing most of this on Monday, I fell a bit behind on the "content" portion ... it just feels a bit shallow to me. I feel like I should've lectio divina'd the texts for each day and at least privately journaled on them. This, as we say, will be next year's plan, and I can use the images that I found this year to illustrate that again, if needed. Or, I can use phrases that have come out of that lectio divina to art journal around. So that's next year's plan. 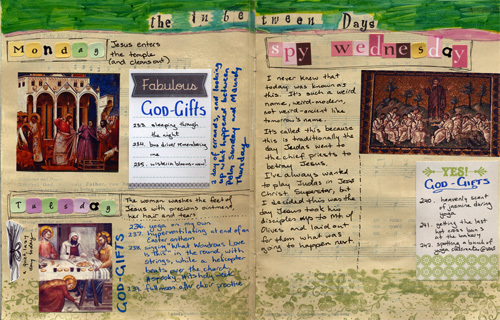 We can call this year a practice run :) For example, I now know that I'll need a ton more pages if I'm going to be journaling lectio divina -- should they be a part of the art journal or separate? And should I make each page a fine art journal page? If so, I really ought to be working on it throughout all of Lent because it takes me about a week to finish a fine art page. and oh my gosh, one of the pictures is crooked ... see what I mean?!?!?!?! Thursday's completed pages will hopefully be posted on Friday, and then Saturday and Sunday on either Sunday afternoon (super-optimistic) or some time on Monday. 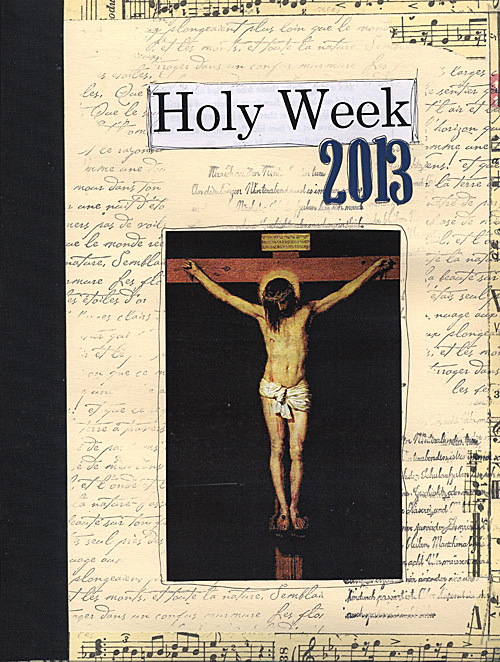 How are you observing Holy Week? That looks fabulous Leanne! I have been woefully absent this Esater season. Just not a good time and I really let the most important things fall by the wayside.